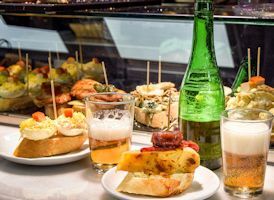 A relaxed tour through the narrow streets of Almeria’s Old Town District, stopping off at various typical Spanish tapas bars where a wonderful selection of fresh seafood, meat and vegetarian tapas are served free with each beer or wine ordered. Guests staying on half board basis can take a lunch from La Envia’s snack bar menu instead of the evening meal on the day of their tapas tour. 10:30h pick up from Hotel Envia, returning at 14:30h. Daytime tour includes visit to Almeria 10th Century Castle. 19:30 pick up from Hotel Envia, returning at 23:30h, Includes visit to Almeria 16th Century Cathedral. 25 Euros per person - minumum 4 pax. La Envia says, it is no exaggeration to say that Tapas Tours are enjoyed by all who go on them, we have found that we get a considerable number of repeat bookings from guests who have been on the Tapas Tour, quite often golfers who have been on the tour and visited our spa return with their wifes/girlfriends or different golfing friends for future visits. We think that offering discounts on bookings for groups of 8 pax provides the perfect opportunity for us to show what Almeria has to offer. Groups of 8 pax is the perfect number for our minibus and a manageable number of people to take to the best tapas bars in Almeria.